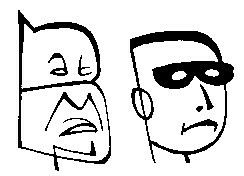 Let me be honest, for once: this story is just an excuse to show you my latest Typefaces. About nine months ago I promised more Batman music, but like many other topics that I have in mind, there is too much other interesting music. But today I want to share with you my first Batman record, a 45 from 1966 by Adam West. I found this record twenty years ago, without knowing that this record existed. My excitement was already great when I bought the 45, but it became even greater when I played the record later that day. It is brilliant! 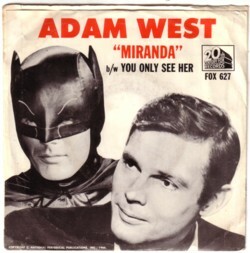 By now it has been re-released on several compilations, but nevertheless, here is Adam West with the magnificent Miranda . By the way, (almost?!) all the actors/characters in the 60’s Batman television series made a record, but there is not yet a CD with all these records out. Or have I missed it? Bravo Frits – je columns zijn de korenbloemen tussen het maaiveld. Ik geniet van verre.